On our visit to Grand Cayman for 16 days, we found so much to see and do. We were there for the sunshine and blue waters. But one of the things we were not going to pass up was the offer to take Afternoon Tea at Ritz-Carlton Grand Cayman. 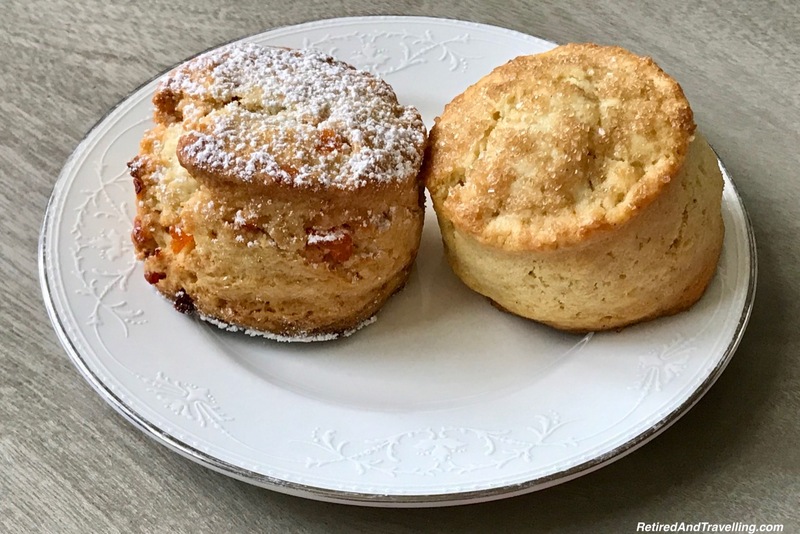 If you read our blog regularly, you will know that we love to indulge in Afternoon Tea when we are at home in Toronto or when we are travelling. 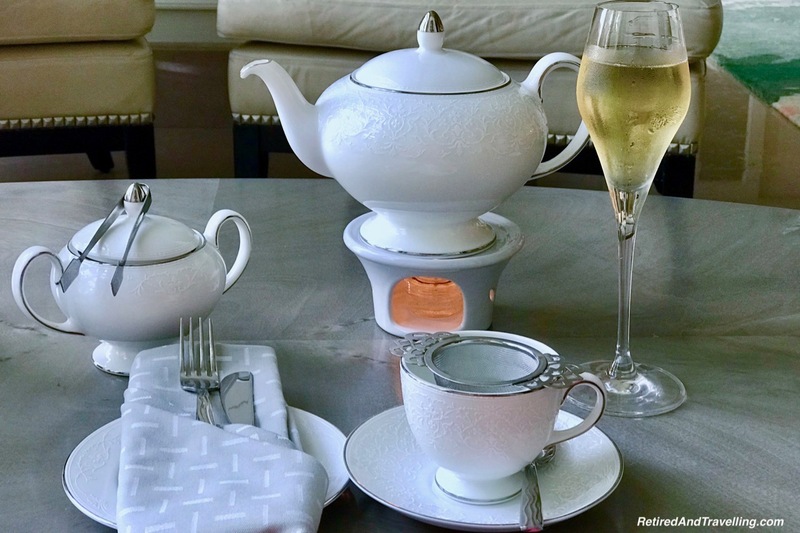 We have had awesome experiences like Afternoon Tea at the Ritz-Carlton in Montreal in front of a roaring fire when the outside temperatures were far below freezing. 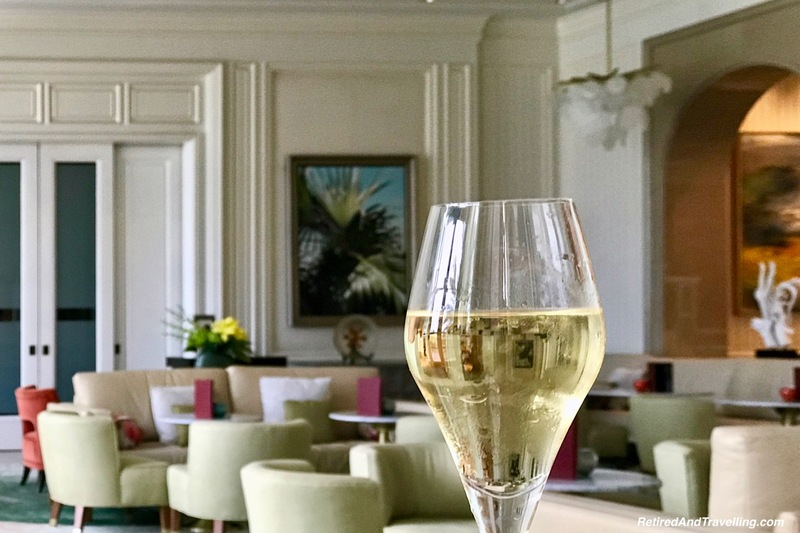 Or the amazing sabrage demonstration (sabre off the top of the champagne bottle) at Afternoon Tea at the St Regis in Washington DC. We have done Afternoon Tea at the Belmond Mount Nelson Hotel in Cape Town for our Christmas Dinner. And Afternoon Tea at the castle in Toronto. 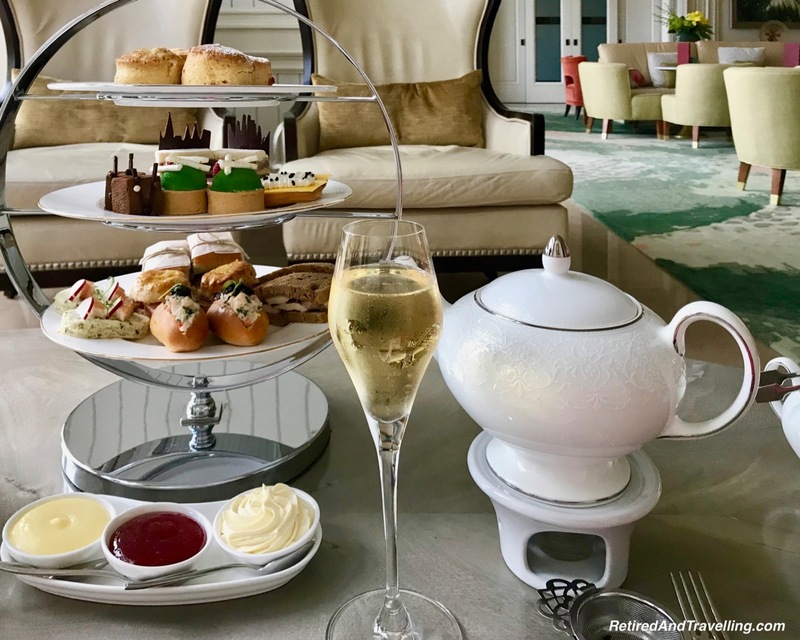 So we were definitely going to add Afternoon Tea at a beach resort when we stayed at the Ritz-Carlton Grand Cayman for 16 days. 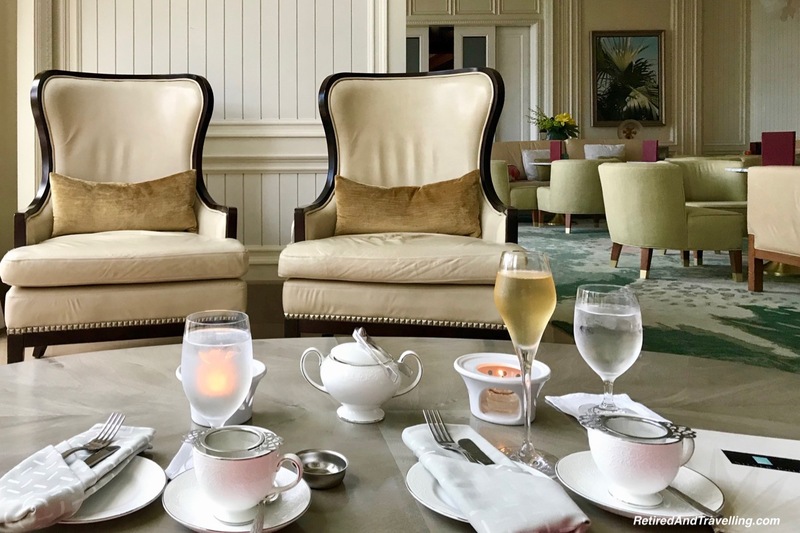 Afternoon Tea at Ritz-Carlton Grand Cayman is served in the Silver Palm Lounge. The tea setting was arranged in one of two quiet nooks. Right off the lounge is an outdoor patio with a view out over the Harbour Pool. Could there be a nicer spot for Afternoon Tea? There are two different Afternoon Tea menus to choose from. The Grand Cayman version included champagne and the Cayman Brac did not. But the food was the same on both menus. There was even a children’s menu for Afternoon Tea. We were lucky on the day we booked to have the entire lounge to ourselves for Afternoon Tea. It meant we could move things around until we got just the right angle for our photos. You know that no food or drink is ever consumed before it is photographed from every angle!! There were many options for teas – black, oolong, white, green, rooibos and decaf herbal teas too. While David did not find a chocolate tea, he found he liked the Silver Palm. I of course found the perfect berry flavoured tea for me. We are always interested to see what form the tea comes in. We have had regular tea bags, open tea bags filled with tea leaves, tea infusers and tea leaves floating in the tea pot. Our tea arrived as tea leaves in the tea pot. And for each of the teas, it showed what the proper steeping time was. The tea pots sat over a small candle that kept the tea hot. We loved that the tea setting had a strainer to catch the tea leaves as we poured. And that there was a little dish to put the strainer in. I do hate when I have to put my tea bag on my plate! 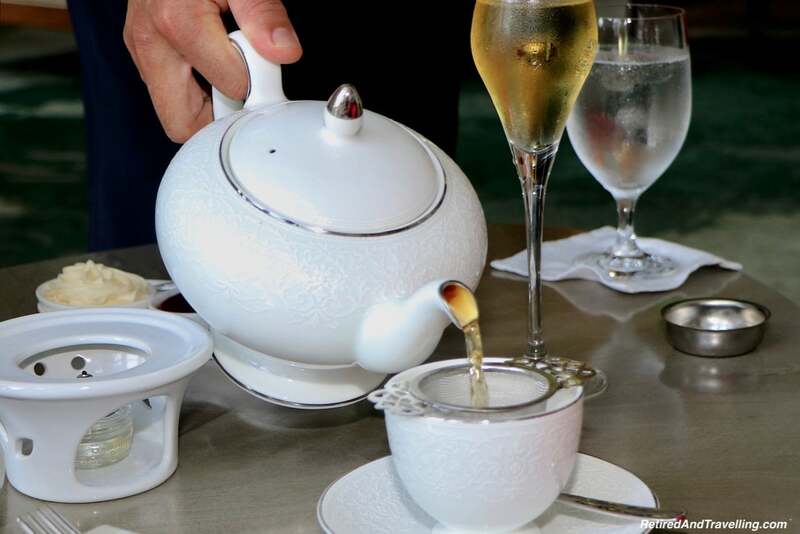 Of course, I added champagne to my Afternoon Tea at Ritz-Carlton Grand Cayman. It seemed like the perfect way to add a little sparkle to this mid-day treat. The tea and champagne got us ready to start the tea ritual. It is always a toss up whether I start with sweet or savoury. All the layers of this tea tray looked so tempting. Luckily Claudia and Shiva gave us a great description of all items so we could decide what to eat in what order. But I decided to start with the savoury delicacies. The lobster salad with bow fin caviar needed to be the first treat we tried. We stayed with the seafood theme and moved on to the smoked trout with dill Crème Fraiche. The prosciutto on a cheddar biscuit with manchago cheese and apricot jelly was recommended as a favourite. It did not disappoint. I was a bit worried about how spicy the jerk chicken with mango chutney might be. But I need not have worried. It was tasty but not too hot. We finished with the roasted vegetables on focaccia bread. We figured we needed some veggies before we started on the sweet treats. 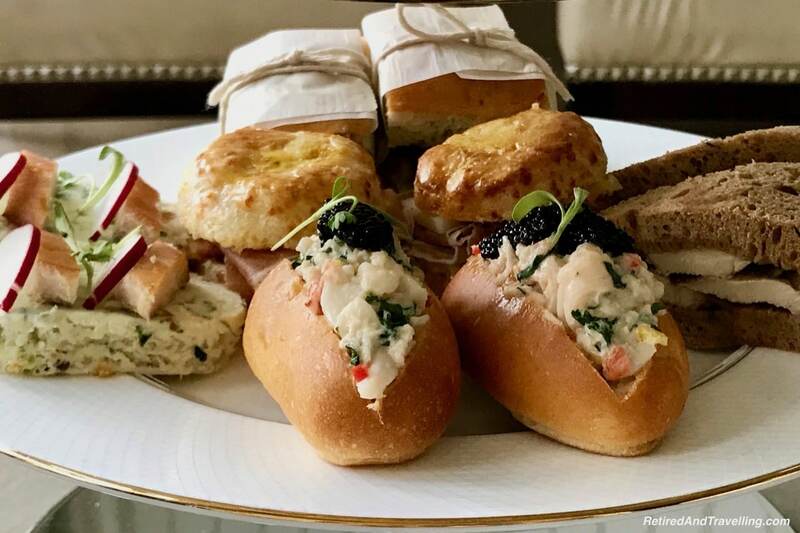 The savoury delicacies were the perfect way to start our Afternoon Tea at Ritz-Carlton Grand Cayman. We are always interested to check out the scones on an Afternoon Tea tray. We love the standard ones. But like to see what the pastry chef comes up with for different flavours. The lemon curd, double cream and raspberry jam were great additions to the fluffy scones. We made sure to take some of the toppings with us when we got our doggy bag to take back to our room. We knew we would not make it through all of the sweets so we divided and conquered the tray. But over the next two days we tried everything on the sweet tray. The chocolate mousse tart with the salted caramel centre was the favourite for us. And the chocoholic also had to try the Opera Cake with coffee, white and milk chocolate as an early treat. There was a great selection of lighter fruit flavoured treats to balance the chocolate. The tropical eclair with the mango cream was delicious and light. The raspberry guava shortbread added a touch of fresh fruit. And the orange-lime tart was a tangy delight with its shortbread base. Every one of the desserts was both pretty and tasty. 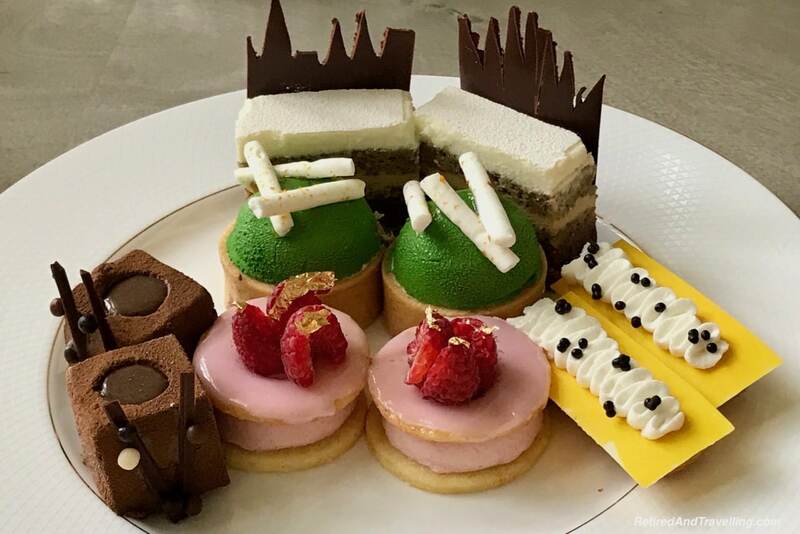 The sweet treats were the perfect balance to the savoury delicacies for Afternoon Tea at Ritz-Carlton Grand Cayman. We started my big milestone birthday with an early celebration to see the colours on Niagara Falls. 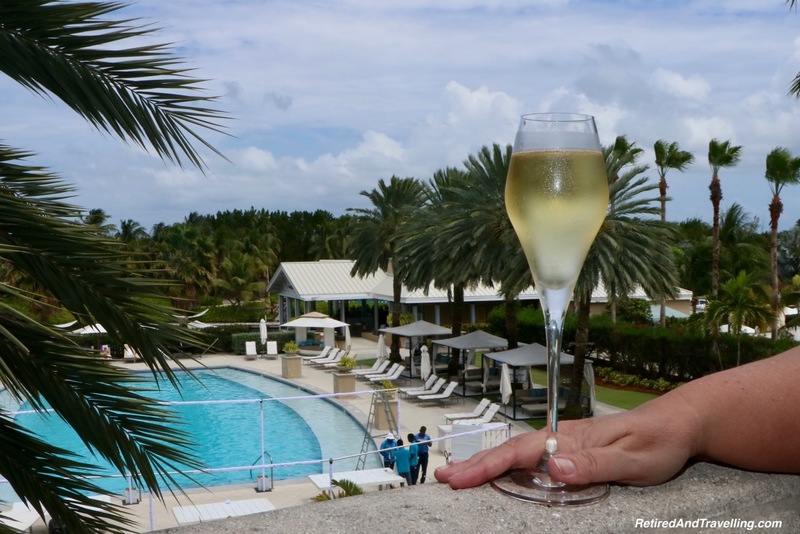 We continued the birthday celebration with 16 days at the Ritz-Carlton Grand Cayman. And started our visit there with two birthday treats. So I thought I was done with birthday surprises. 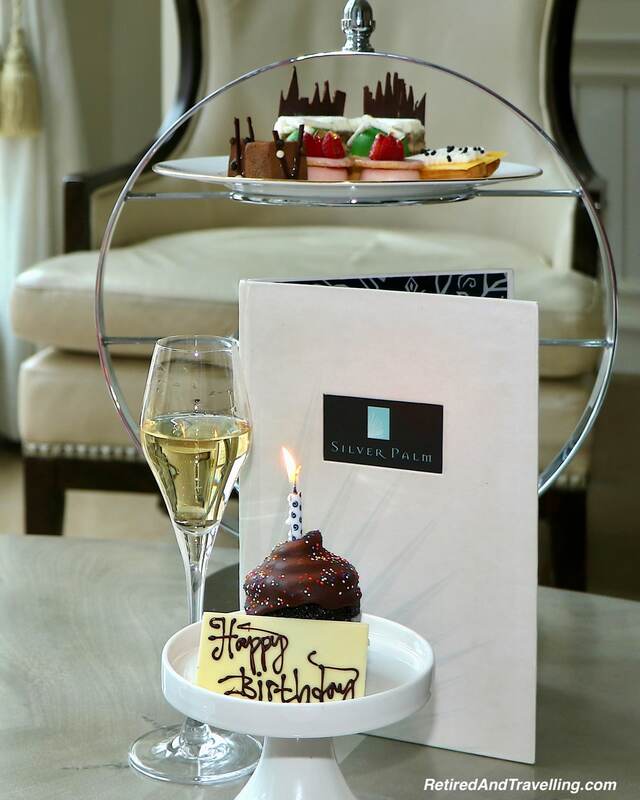 When it was clear we were done with our tea tray, the lounge staff brought out yet another birthday cupcake. Complete with a candle. And they sang Happy Birthday! I was glad we were the only ones in the lounge for Afternoon Tea. 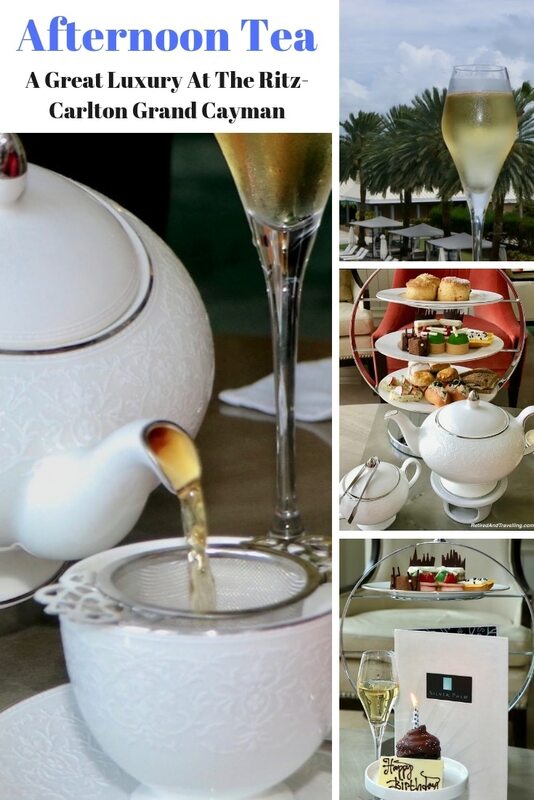 If you have a special occasion, make sure to mention it when you book Afternoon Tea at Ritz-Carlton Grand Cayman. I am sure you will get a great surprise. 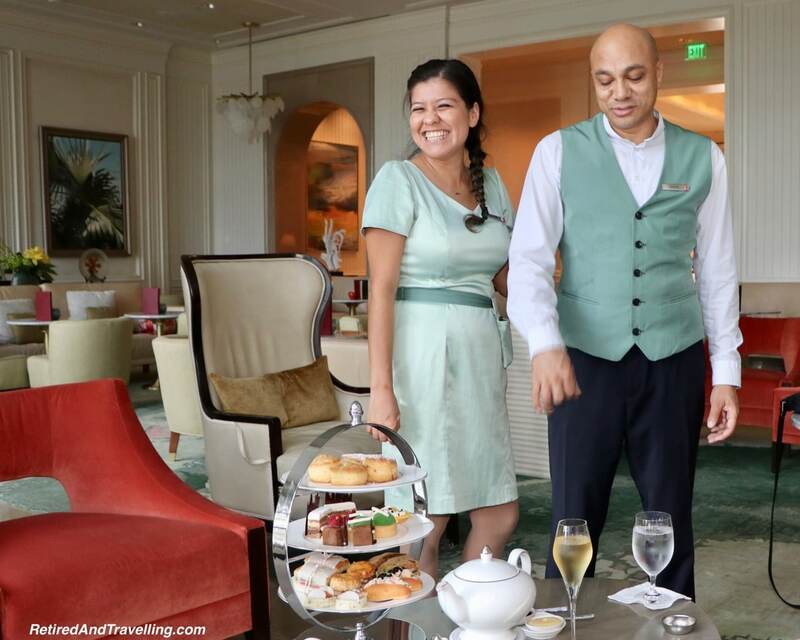 We were so glad we were invited to try the Afternoon Tea at Ritz-Carlton Grand Cayman. It was a great way to take some time out of our busy beach days in Grand Cayman and just relax. We loved the broad selection of teas. The savoury delicacies were varied and a great way to start our Afternoon Tea. But the sweet selection blew us away. In case you are wondering, we did not eat everything on that tea tray on our Afternoon Tea at Ritz-Carlton Grand Cayman. We had about half our treats packaged up. And got to enjoy them over the next two days. 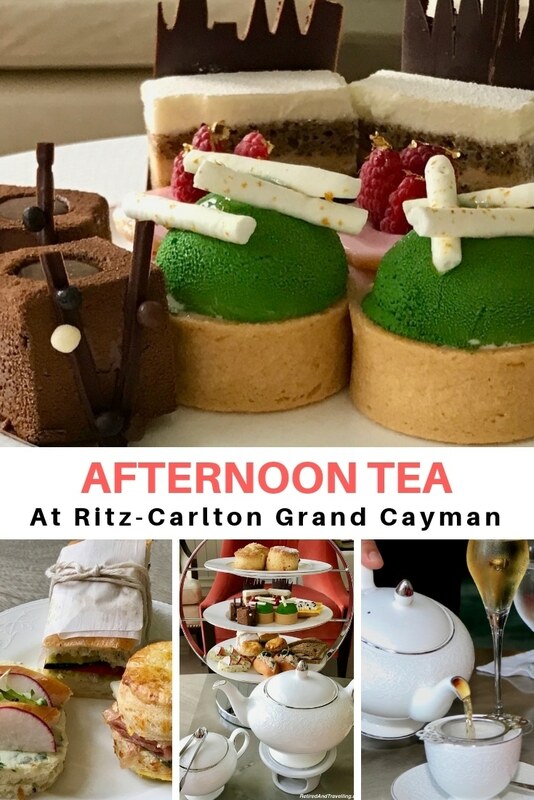 If you are staying in Grand Cayman or just have a cruise port day and you are looking for things to do, plan a visit for Afternoon Tea at Ritz-Carlton Grand Cayman. It is a great way to indulge in a lot of food and a pampering afternoon visit. It was certainly a wonderful treat during our 16 days in Grand Cayman. 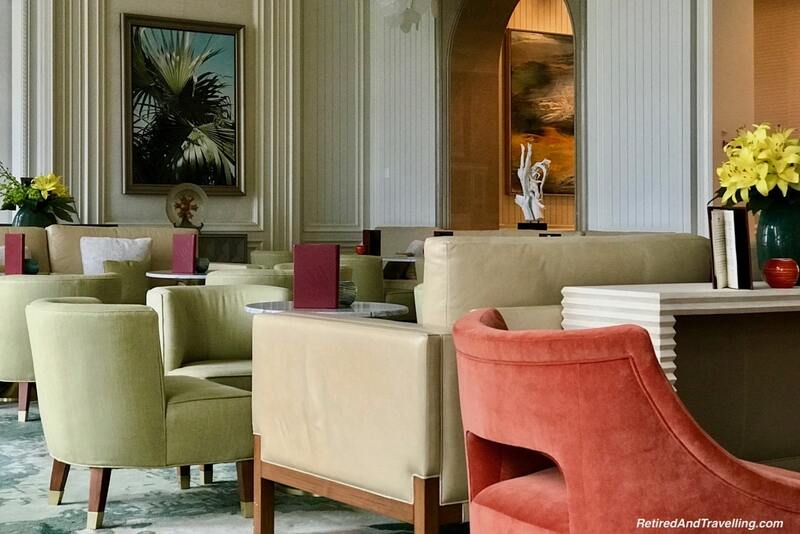 Have you tried Afternoon Tea at Ritz-Carlton Grand Cayman? What was your favourite treat? Notice: We were invited to Afternoon Tea at the Ritz-Carlton Grand Cayman. But it is easy to see from all the Afternoon Tea blog posts we have written that we have a sound basis for comparison. The opinions expressed in this post truly represent the great experience we had. What a wonderful way to spend an afternoon. All that food looks amazing!!. 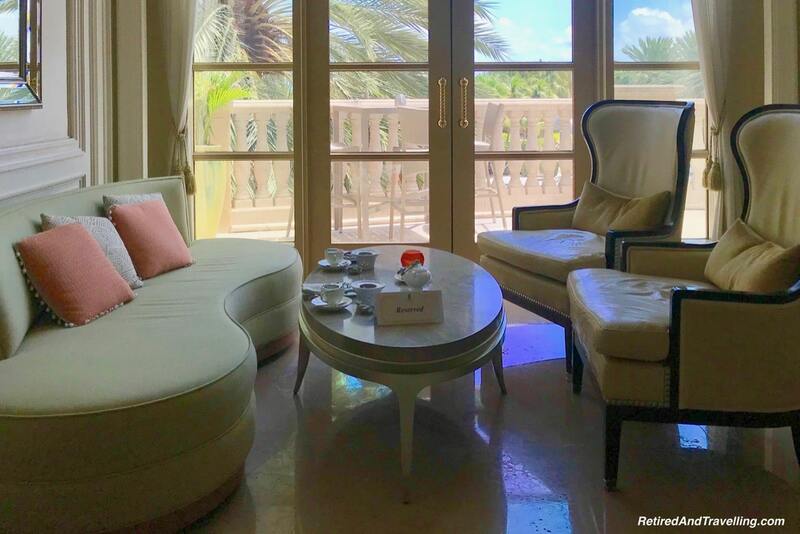 I love treating myself with an afternoon tea and the one at the Ritz Carlton Grand Cayman looks perfectly indulgent. Of course I’d have to get the champagne, what goes better with lobster salad and caviar? Tea and Champagne are kind of odd combo to me. Maybe it is common in the USA. We Indians, also love our tea but it is milk tea. I loved the photo of dessert, looks really yummy. You didn’t mention the cost here. How much does it cost? I always enjoy your posts on Afternoon teas. 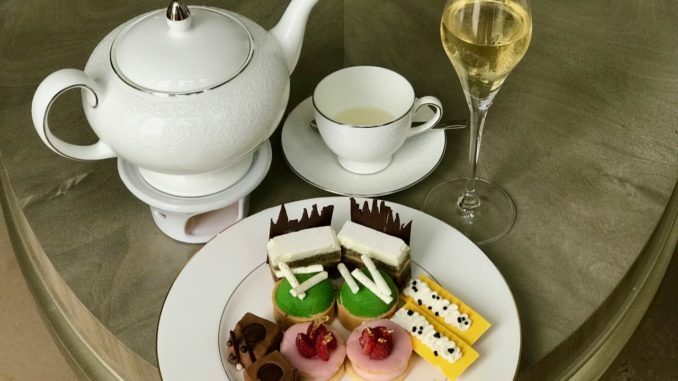 I never had Afternoon tea on any Ritz Carlton hotel. So will rectify that soon. I always look forward to eating the sweet stuff. lol. Glad you had a fantastic stay with them and a wonderful birthday! Wow what a spread, those scones look amazing! This is one of my favorite things to experience! All of those goodies are so tempting. I’m not a tea drinker but I would go for all the yummy delicacies on those pretty plates. I wouldn’t be able to decide what to leave! Wow that seems so grand to me! I would like to experience this luxury some day. There is a hotel of this chain in my city too. Will head there one of the weekends. What a delicious afternoon tea. From those petite snacks to the wine. That glass of sparkling wine has made me want one right now but it’s too early in the morning to be drinking alone.